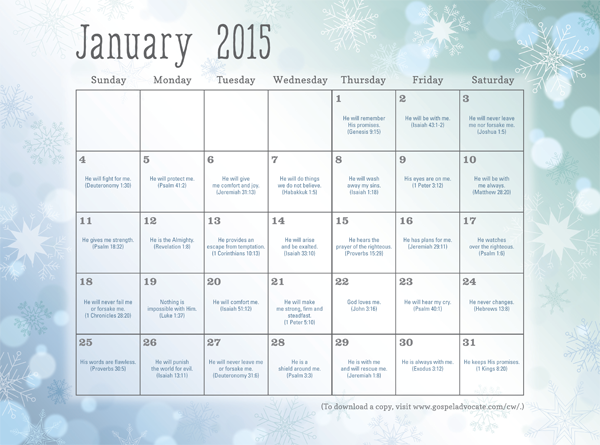 Last year’s prayer calendar, written by Michelle Moore, was so well-received by our readers that Michelle has prepared a new calendar for 2015. The theme of this year’s calendar is “God’s Promises.” With each issue the two-page color insert will appear on pages 27 and 28, suitable for framing or posting on your refrigerator or near your work station, or you can download the calendar for January and February here. In the January/February 2015 issue, Michelle describes the struggles her family went through with the death of her 16-year-old son, Joshua, in 2013. Joshua had been making plans to go to Harding University in preparation for being a minister. This calendar theme came largely from Michelle’s attempts to heal from this tragic event. The Moore family has begun working toward an endowment in Joshua’s memory, with the goal of providing a scholarship to Harding for a student entering the College of Bible and Ministry. For more information on the Joshua Kyle Moore Memorial Scholarship, contact Michael and Michelle Moore at michael.moore3@cox.com or visit the “Joshua Kyle Moore Endowed Memorial Scholarship” Facebook page.